The antenna farm now has a Rohn 55g 100 ft tower with a 22 ft Chromolly mast. The top Yagi is a 2 element 40 (Force 12 Magnum 240N). The 10-20 system has a "stack" from Force 12 with a C49XR at 100 ft and a C49XR at 40 ft. The top antennas turn with a M2 Orion 2800 rotor and the lower C49XR turns with a K0XG Ring rotor. I am using an Array Solutions Stack match for the 10-20 Yagis. My older tower, a Rohn HDBX 48, now houses my WARC antenna, a Force 12 4BA along with a Force 12 220, 2 element 20 meter monobander. The 4BA antenna has 3 elements on 10/12 and 15/17. The 4BA doubles as a multiplier antenna for my M-1 contesting and as my WARC antenna. 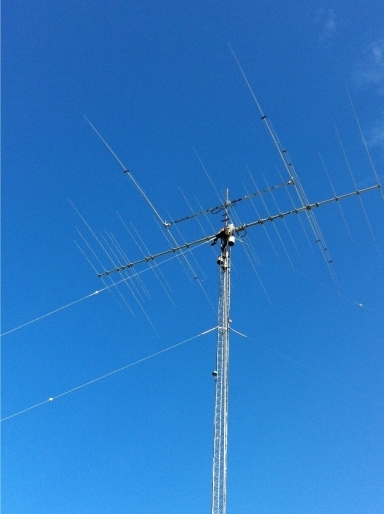 The 2 element 20 monobander serves as a spotting antenna as well as a 20 meter yagi for domestic contesting. The BX tower also has an 80 meter dipole and a 40 meter dipole, for NVIS and domestic contesting purposes. I was able to upgrade to a stack of C49XR yagis for 10-20 contesting and a new 2 element 40 yagi for better gain and band coverage. I plan to be at VP5 for the ARRL CW Contest and at VP5H with WØGJ for the ARRL DX SSB contest. 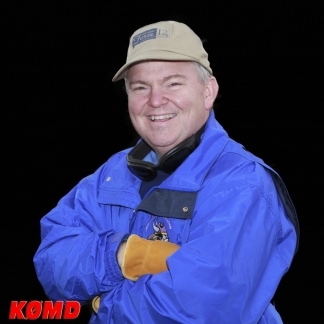 It is possible I will be CE2/KØMD for the CQ CW WW contest. I work as a cardiologist at the Mayo Clinic in Rochester, Minnesota so my call is a vanity call! I am the second physician to hold it. I did not know the first ham who had it but he has a wonderful reputation as several hams have stopped by on the air for chats to tell me about him. His name was Dr. Paul Uhlig and he is described as a "ham who had a deep respect for each person as an individual, no matter what their station in life othewise. He genuinely respected people, and that of course was a large reason for the deep affection and respect that was shown to him." I thank his son Dr. Paul Uhlig for sharing about his late father with me. Callsigns have legacies just like names and K0MD is certainly one of those. I hope my patients and friends will say the same of me as was said of the late Dr. Uhllig. I have been licensed since 1977, first holding the call WD4HAD. I really enjoyed ham radio as a teenager living in the Appalachian mountains. It connected me to the world. My first station was a Heathkit HW 101, later upgraded to a Drake B line. I worked to earn money to install a tower and triband Yagi. Dxing was my interest from the earliest days. I moved to Rochester, Minnesota in June 1989 and changed to KFØFW, then AAØPS. I briefly lived in Kentucky for most of 1997 and had the call WK4W. I changed to KØMD in March 1998 and have held this call longer than any other previous callsign. I was not so active in our hobby from 1998-2006 but did manage to have a tower and Yagi to allow intermittent Dxing. We moved to the current QTH in 2003. It has 5 acres and enough room for a small antenna farm. I am married and have four children. Three of our children are hams, KØAEW, KØKEW and WØSMW. My lovely wife is not a ham - she reasons someone in the home should remain sane and free of influence from the ads in QST and CQ. Our fourth child can operate the rig but he is not old enough to take the exams yet. My first overseas operation was at B1Z with the premiere club in Beijing for CQ WPX CW 2007. It was a blast and they have the finest antennas of any club I have seen. We placed first place M/M in China and 13th in the world as BY1TX. They have a tremendous group of operators. I have subsequently operated several times from Chile as CE2/KØMD. I try to operate every August when I am at medical conferences in Vina del Mar and in November/December when I am at meetings also. I entered CQ CW WW 2009 from Vina del Mar, Chile and placed first place SOAB Chile. It was amazing to get a certificate. I have had the privilege of operating with Dr Glenn Johnson, WØGJ at VP5H for three years during ARRL SSB DX contest. Glenn is the best operator I have seen and a great teacher as well. There is no propagation like that experienced in the Caribbean. The bands are open nearly 24/7 from there and you are an instant pileup when on the air. We rent VP5JM's hamlet which has great antennas. She has a Force 12 XR5 Yagi for 10-20 and a 240B for 40 meters. Glenn has built dipoles there for 80 and 160 which we use.